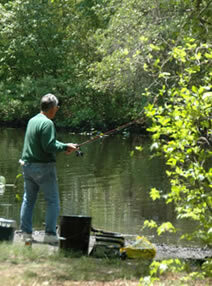 Click here for NJ Division of Fish and Wildlife's Bear Safety Tips. Visitors are asked to report any bear sighting to a Park Ranger or local police. This 2,270 acre wooded park was acquired and developed with campers in mind. A major attraction is the 17-acre lake for fishing, boating, and ice-skating. The park also features miles of trails, an archery range and playgrounds. A walk through Turkey Swamp reveals a primitive wilderness. Much of the park is forested by pitch pine and oak trees with an understory of bracken fern, pepper bush, blueberry, and catbriar. Many plants and animals associated with the NJ Pine Barrens can be found here. Visitors to the park can fish for bass, catfish, and bluegills either from the shore or from kayaks, rowboats, canoes and paddleboats available for rental in summer. Bait (nightcrawler and garden worms) can be purchased in the Campground Office from April-November. Boat rentals are available weekends only from May 1 through Father's Day; daily Father's Day through Labor Day; and weekends only again from Labor Day through Columbus Day. Boat rental hours are 10 a.m.-4:30 p.m. weekdays and 10 a.m.-5:30 p.m. weekends. Please note tax is not included and there is a $10 refundable deposit. Turkey Swamp Park features an archery range that is open year round during posted park hours. This stand-up range features seven shooting stations, varying from 15 to 40 yards. Each station is composed of two excelsior bales. Those under 18 years of age shall be supervised by someone age 21 or older. Users must provide their own equipment including paper targets. No broadhead arrows allowed, only field points. The Park System offers archery clinics as well as an introduction to archery clinic for organized groups. Two soccer fields are available for rental for games only. Visit our Athletic Field Rentals page for further information. This park was named "Turkey" after the historical label for Adelphia, and "Swamp" because the thick forest with its high water table forms sphagnum bogs wherever the land dips. 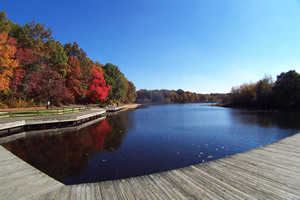 The core of the park (lake, picnic areas and campgrounds) was purchased in 1963, while the addition of adjacent land in the 1970s and more recently gave the park its present configuration. Wooded campsites, Electrical service, Water service (April 1 - November 15), Drinking water, Modern restroom with hot showers and laundry, a self serve sanitary dump station for campers with holding tanks. (It is free for park campers and available for a fee for others), Fire rings for charcoal cooking and campfires, picnic tables, children's playground. Telephone reservations are available using Visa, Discover, or MasterCard by calling the Campground office at 732-462-7286 after 11 a.m. daily. Mail-in reservations are accepted with check or money order using the Reservation Request Form. Full payment is required at the time the reservation is made. See our fees. See our refund policy. For phone-in and mail advanced reservations, a two-night minimum is required on weekends, three nights on holiday weekends. Walk-in reservations, using cash, check or credit card, are available on day-of-stay and no minimum stay is required. Internet reservations are not available. Advanced reservations are accepted for the current calendar year only. At the park's Nomoco Activity Area (143 Nomoco Rd., Freehold, one mile southwest of the main entrance), platform tent camping is available to groups from chartered organizations from April 1 - November 15. For reservations and information, call 732-462-7286. Reservations can be made at the shelter building, at the park, or by mail. Turkey Swamp Park features reservable group picnic areas and is a great spot to host a family reunion, an office get together or a bunch of friends. Multi-use and fitness trails traverse the park which is located at the northern end of the Pine Barrens. Turkey Swamp's terrain is relatively level and the 17 acre lake adds scenic interest. NJ Turnpike to Exit 7A to Interstate 195 east. Follow I-195 east. Follow I-195 to exit 22. Turn left onto Jackson Mills Rd. north. Follow Jackson Mills Rd. to Georgia Rd., turn left and follow 1.7 miles to main park entrance. Garden State Parkway to Exit 98 to Interstate 195 west. I-195 west to Exit 22. Turn right onto Jackson Mills Rd. north; follow Jackson Mills Rd. to Georgia Rd. ; turn left and follow 1.7 miles to main park entrance. State Hwy. 9 to route 524 west. Follow 524 west to Georgia Rd., turn left and follow Georgia Rd. 1.7 miles to main entrance. Nomoco Activity Area Is located 1.5 miles past the main park entrance. Continue south on Georgia Rd. to Nomoco Rd. ; turn right and follow signs to Activity Area.